When you are on a health and fitness journey, and I mean who isn't? We need to find meals and ideas that are quick and easy for those times when you get home late, have no food lying around and need something healthy and quick so you don't get on the dial to Ubereats. Tinned tuna (or salmon for that matter) is one of my favourite ways to stay on track when time is not abundant or when I am simply too damn lazy. I know quite a few of my clients are always saying that want to include more fish into their diet, I mean we all know how beneficial omega-3's are, but I feel tuna always gets a bad wrap so I thought i'd give you some ways to spice up tuna into meals that no doubt will be better received than a boring tuna sandwich. Below are 10 of my favourite ways to create quick, easy and most importantly healthy meals with tuna that the whole family with love. The best part of these is that they require NO cooking what so ever! Just throw whatever veggies you have on hand with the tuna into a nori sheet and roll away. If you are feeling fancy you could add in some cooked brown rice or quinoa. 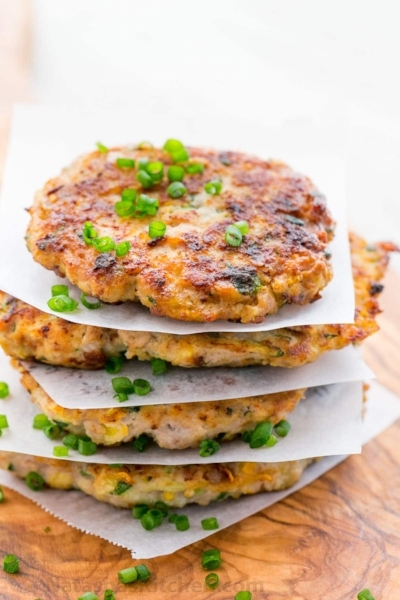 These are a great midweek dinner, serve with them a salad or on a multigrain roll with salad as a healthy burger! With these bad boys i'd be throwing in some spring onions, garlic powder, pepper and peas into the mix and serving with a big side of juicy greens. #happydays! This recipe is one of my favourite recipes from my ebook which you can get here. I also like to add a hit of chilli into it to give it that extra bit of flavour. 1. Cook pasta according to packet directions and drain. 2. In a fry pan over medium heat add red onion, garlic and tuna. Toss for 1-2 minutes. 3. Add cherry tomatoes and toss for a further 1-2 minutes until blistered. 4. Add passata, lemon juice and zest, chilli and olives to pan. Stir gently to combine. Remove from heat. 5. Add tomato mixture to pasta and gently fold together. 6. Fold through rocket or spinach and feta and serve immediately. Quick and easy for lunches - just pre boiled your potatoes and eggs and you can throw these together for your workday meal prep. 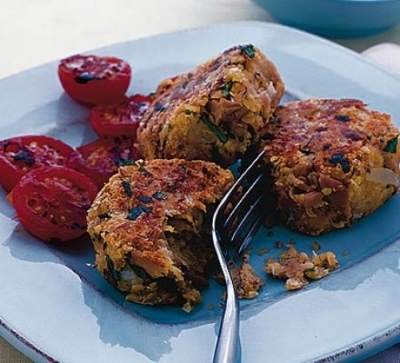 Swap the chicken mince for tinned tuna in these fritters. They go well any time of the day - serve with some poached eggs at breaky or with greens or a salad later in the day. If you are in need of a 5 minute meal to keep the kids happy or maybe cooking for one is getting a bit tedious, these tuna pasta melts will have you sorted. Make sure you use a multigrain or rye bread to keep the fibre content up and keep you full for longer! Carbs: Roast sweet potato, chickpeas or lentils, cooked quinoa or brown rice. Dressing: Tahini, balsamic glaze, lemon juice + extra virgin olive oil. My general rule is as many veggies as possible. 1-2 Fats and 1 carb. Then obviously the tuna for protein! This is a great fresh summer pasta dish when you are wanting a bit more of a substantial meal. If you are looking for a lighter, lower carb option you could try this with zucchini noodles! Don't forget to always serve your pasta dishes with a side salad or steamed veggies. Okay so this one isn't all that fancy but I HAD to include it because it is one of my go-to meals when I literally have zero time, and zero fresh produce. It is stupidly simple so I promise you cannot stuff it up! So this is it: Heat up 1 packet of frozen veg in the microwave (in Australia we can get little individual portion steam packets). Heat up a 90 second microwave rice cup (again these are pre-portioned, parcooked rice packets you can just whack in the microwave). In a bowl combine your tuna, rice, veggies and then toss through a drizzle of soy sauce and sweet chilli sauce. This is what I grab on my way to work if I haven't prepped any meals. Super easy, no preparation required and no fresh food required. #winner. That wraps up the 10 ways with tinned tuna so hopefully you have found some ideas to include tuna a little more frequently into your diet. Be sure to tag me on facebook or instagram if you create any of these.